A series of tables, one for each group of nodes in the tree. All top-level (Type) nodes are listed in the first table. Entries in this table point to second-level tables. Each second-level tree has the same Type ID but different Name IDs. Third-level trees have the same Type and Name IDs but different Language IDs. Each individual table is immediately followed by directory entries, in which each entry has a name or numeric identifier and a pointer to a data description or a table at the next lower level. Two-byte-aligned Unicode strings, which serve as string data that is pointed to by directory entries. An array of records, pointed to by tables, that describe the actual size and location of the resource data. These records are the leaves in the resource-description tree. Raw data of the resource section. The size and location information in the Resource Data Descriptions field delimit the individual regions of resource data. Resource flags. This field is reserved for future use. It is currently set to zero. The time that the resource data was created by the resource compiler. The major version number, set by the user. The minor version number, set by the user. The number of directory entries immediately following the table that use strings to identify Type, Name, or Language entries (depending on the level of the table). The number of directory entries immediately following the Name entries that use numeric IDs for Type, Name, or Language entries. that demonstrate how to use this information. functions make understanding the PE file format easier to cope with. file format also retains the old familiar MZ header from MS-DOS. and working your way down through the file. development files is included in the PEFile sample application. address in the IMAGE_DIRECTORY_ENTRY_RESOURCE DataDirectory. The offset of a string that gives the Type, Name, or Language ID entry, depending on level of table. A 32-bit integer that identifies the Type, Name, or Language ID entry. High bit 0. Address of a Resource Data entry (a leaf). High bit 1. The lower 31 bits are the address of another resource directory table (the next level down). accessing data in PE files. discussion on how to use PEFILE.DLL. The size of the string, not including length field itself. The variable-length Unicode string data, word-aligned. linker option when linking the executable file. 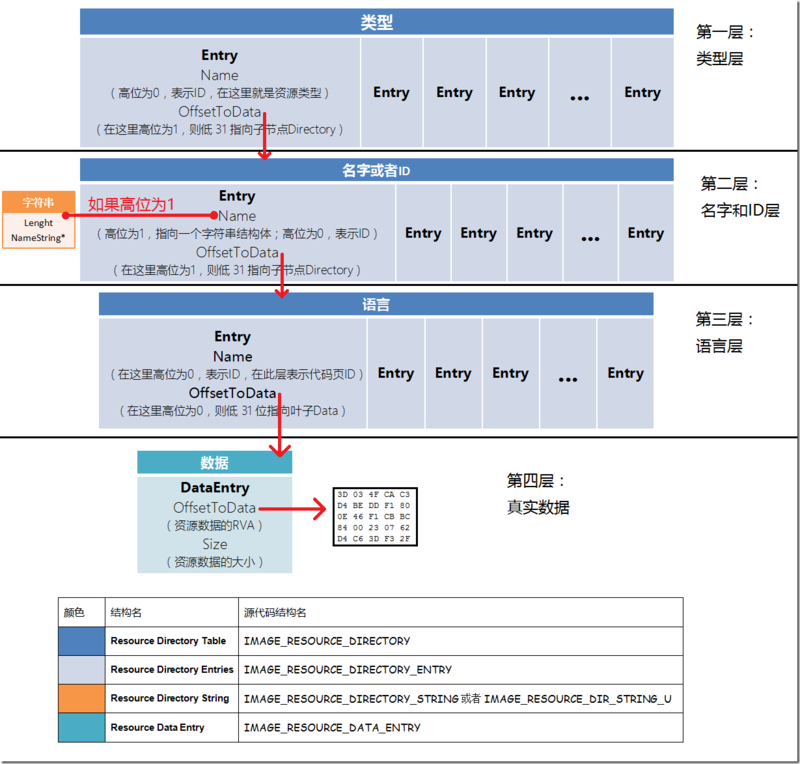 The address of a unit of resource data in the Resource Data area. The size, in bytes, of the resource data that is pointed to by the Data RVA field. The code page that is used to decode code point values within the resource data. Typically, the code page would be the Unicode code page. the size of a DWORD. 0 4 Characteristics Resource flags. This field is reserved for future use. It is currently set to zero. 4 4 Time/Date Stamp The time that the resource data was created by the resource compiler. 8 2 Major Version The major version number, set by the user. 10 2 Minor Version The minor version number, set by the user. 12 2 Number of Name Entries The number of directory entries immediately following the table that use strings to identify Type, Name, or Language entries (depending on the level of the table). 14 2 Number of ID Entries The number of directory entries immediately following the Name entries that use numeric IDs for Type, Name, or Language entries. in the WINNT.H include file. the rest of the file data. file has been stripped (IMAGE_FILE_DEBUG_STRIPPED) was invented. the debug information is present in the file or not. the IMAGE_FILE_HEADER structure described above. alignment information, and so forth. As you can see, the list of fields in this structure is rather lengthy. exploring the PE file format. of resource data in the Resource Data area. the resource data that is pointed to by the Data RVA field. the code page would be the Unicode code page. Magic . I was unable to track down what this field is used for. For the EXEVIEW.EXE sample application, the value is 0x010B or 267. Windows NT, includes linker version 2.39 (2.27 hex). SizeOfCode . Size of executable code. SizeOfInitializedData . Size of initialized data. SizeOfUninitializedData . Size of uninitialized data. Windows NT executable image from the optional header. loader support for much of the Windows NT–specific process behavior. Following is a summary of these fields. you can override the default with the -BASE: linker switch. set using the -ALIGN: linker switch. the application; in Microsoft Excel version 4.0, it would be 4.
the application; in Microsoft Excel version 4.0, it would be 0.
set to zero by the linker. header, PE file header, PE optional header, and PE section headers. The section bodies begin at this location in the file. information and will not be published. SizeOfStackReserve , SizeOfStackCommit , SizeOfHeapReserve , SizeOfHeapCommit . switches -STACKSIZE: and -HEAPSIZE: . load, or the default, which is to let things run normally. of valid entries in the array. 16 possible data directories, 11 of which are now being used. “Predefined Sections” later in this article. exact file offset location of the data directory. file, including code, data, resources, and other executable information. characters long, for which the first character must be a period. field that is not currently used. to the ImageBase virtual address in the optional header structure. be less than or equal to a multiple of FileAlignment in the file. section body in the file. PointerToRelocations , PointerToLinenumbers , NumberOfRelocations , NumberOfLinenumbers . None of these fields are used in the PE file format. Format specification located on this CD. locate a specific data directory. of the data directory to a specific address into the file. common to typical Windows NT PE files. Windows version 3.1) into a single section called “.text” in Windows NT. there is no advantage to separating code into distinct code segments. the operating system and the application developer. size, it is easy to walk backward in the table to find its beginning. constants, and debug directory information. section’s data is further structured into a resource tree. resource, a resource name, or a resource’s language ID. tree, either a directory node or a leaf node. relative to the location of the root node. the resource tree becomes—even with as few resources as this. more entry and, consequently, another branch for the dialog resources. each one here at the second level of the tree. string table as an ID resource. the value 1, indicating the presence of one entry. Below level two, the resource tree does not branch out any further. node—the IMAGE_RESOURCE_DATA_ENTRY structure mentioned earlier. (each 2 bytes long) for the same exported functions. bother when I already did this for you? information for a specific module. 6F72 0000 4501 5465  7874 4F75 7441 0000  or..E.TextOutA..
the function names, if any. the list of function names ends with one that is zero. virtual addresses that correspond exactly to the list of function names. virtual addresses pointing to imported function names. those directories references debug information in the .debug section. information, the export data section will also include the image name. to locate specific debug information. name is as simple as invoking the CopyMemory function. for normal image file debug information. format is similar to, if not based on, the COFF specification. unique sections for code and data. header to indicate that the debug data has been stripped. first parameter to every function. function GetSectionHeaderByName with the exact name of the section.